Plants flowering at the wrong time of year suggest the approach of a powerful wind. Dolphins inexplicably abandon the harbor. Familiar birds are suddenly nowhere to be seen. Such observations have been recounted by local fisherfolk and Native Americans as signs that a serious storm is on the way. We are often asked if Pineland’s earliest residents predicted destructive storms and how they survived the deadly impacts of such events. These questions were on our minds as we watched the approach of Hurricane Irma while preparing our buildings and properties for a predicted direct eyewall approach over Pineland with a 9-12 foot storm surge and over 100 miles-per-hour winds. Having heard the stories, we tried in the days just before Irma’s arrival to watch for signs of the storm’s approach. Would we see changes in the winds, waters, and wildlife? But, over and over again we found ourselves pulled to electronic media for data. People of the past must have had their own warning signs – we have ours. And, heeding the information, we prepared. Sensitive archaeological materials were evacuated to our parent museum, the Florida Museum on the University of Florida campus. 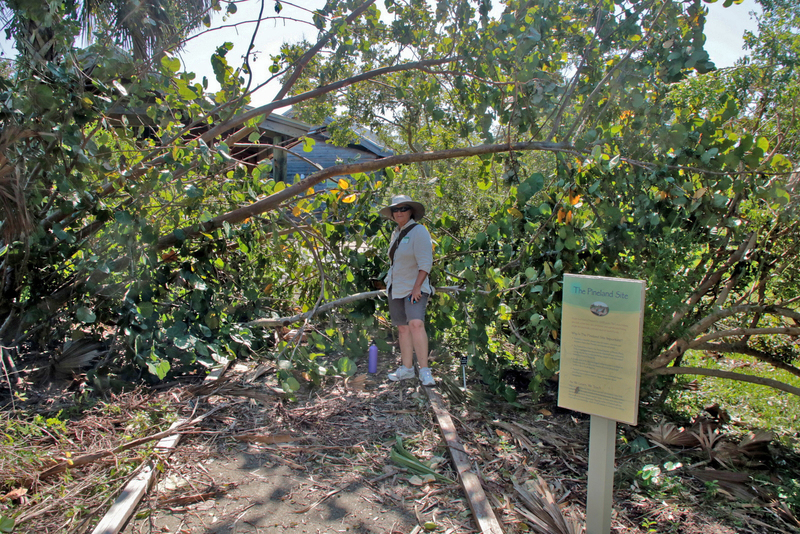 We trimmed trees around the Ruby Gill House and the Calusa Heritage Trail Visitor Center. We secured vulnerable books, paper materials, and reference collections in plastic bins. 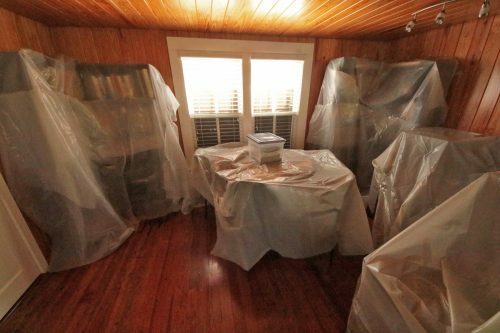 We disconnected computers, shrouded furnishings in plastic sheeting, pulled maintenance equipment from the field. The Pineland Post Office, which we manage, was shuttered. Our staff simultaneously prepared their homes, families, and pets preceding evacuation orders. Archaeological excavations give evidence of a powerful storm that struck Pineland about A.D. 300. Creatures large and small, as diverse as sea turtles, sea urchins, and surf clams, were blown across Pine Island Sound and stranded on Pineland’s shore. Soils from uplands and maritime areas, borne by wind and water, forever changed the landscape. After the storm, tiny truncatella snails moved in to feed on decaying plant matter that marked the high reach of the storm surge and then themselves died in place. All of this evidence points to a massive storm that happened 1700 years ago, what would be called a category 4 or 5 today. Did Pineland’s people have the advantage of preparing for that storm? Archaeological evidence of their lives on the scale of days is not possible, and the Calusa and their ancestors left no written records. Archaeological evidence does show that these residents made specific and targeted decisions about matters related to climatic and seasonal influences and passed on that knowledge. Pineland residents nurtured specific plants, changed fishing methods to coincide with seasonal abundances, and engineered their landscapes. Their tools evolved and improved in function and manufacturing technique and they staged dramatic processions and rituals and sang songs with words and meaning we will never know. They lived at this place, fraught with tropical storms that uproot everything once thought permanent. They may not have predicted the powerful A.D. 300 hurricane but doubtless they were not surprised that it happened. As it came to pass, we were fortunate. A 25-mile shift of the eyewall to the east meant Irma made landfall at Marco Island instead of directly at Pineland. It also reduced the storm surge to about 3.5 feet above normal predicted high tides. Sustained winds of 79 miles per hour were measured at Ft. Myers Beach but gusts well above 79 were felt across the area. Our buildings held strong, although we joined over 6 million Floridians in being without power and we lost internet capabilities for a month. Vegetation at our sites did sustain major damage, including the toppling of a tree at the Ruby Gill House that blocked Pineland Road and meant that we sprang into action post-storm immediately after the danger passed. As we cut our way through downed branches the size of small logs with chainsaws and steel-bladed loppers, we found ourselves reflecting on post-storm activities of past Pinelanders. Our thoughts wandered to Calusa crews erecting buildings that could hold a thousand people, and responses to storms that must have ranged from wistful sadness to steely determination to clean up and rebuild. We bemoaned aloud that these days downed wood is “debris” and wondered how we might use it if only we were not on a schedule that necessitated it be moved to the road to be taken “away.” We thought too of the recent work by RRC archaeologists and colleagues at Pineland and Mound Key focusing on the role of fuelwood as a means to preserve surplus food through drying and cooking, an essential factor in the rise of the Calusa into a powerful non-agricultural society. Recognizing the previous importance of wood somehow made the days of cutting and clearing less weary. The most startling and impactful change to the vegetation was the loss of the top of an iconic strangler fig (Ficus aurea), which had graced the top of Brown’s Mound. With its base already at 25 feet elevation, its massive limbs reached nearly 60 feet high. 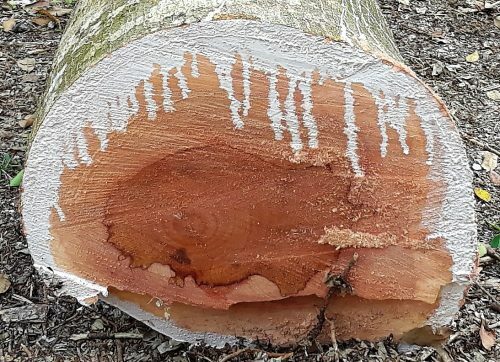 Although hurricane-force winds caused the damage, an expert determined the tree had not been compromised in advance at the point where limbs and braches were torn from the trunk. 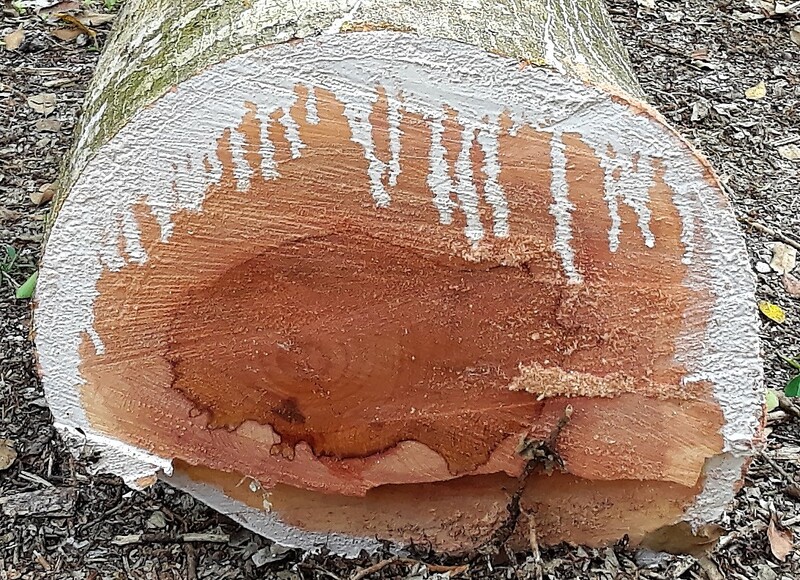 A section of hefty trunk remained (see the accompanying photos), but there was little doubt that the amount of weight beyond the split meant more would fall at some impossible-to-predict time, causing damage to the deck and danger to visitors. 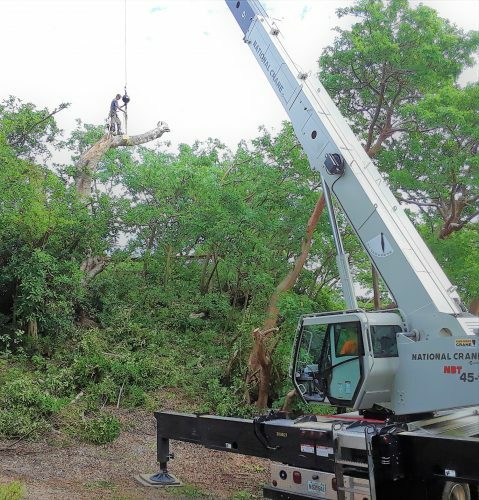 Considering the deck, the surrounding trees, the sensitive nature of the mound, and a desire to save remaining parts of the tree, Gerard’s Tree Service brought in a specialized crane to lower trunks to the ground. Gerard himself embraced the tree, strapped himself to the trunk, and cut it into smaller segments. We marveled at the white latex sap oozing into the cut surfaces of the limbs, being reminded of the usefulness of that sap to the Calusa. Several volunteers helped us before and after Irma including Cathy House, Kay Luongo, Paula Streeter, Brenda Anderson, Bruce Anderson, Gayle Sheets, and Charles O’Connor, along with Rachael Kangas and Sara Ayers-Rigsby of the Florida Public Archaeology Network. Our part-time maintenance assistant Dale Schneider and full-time grounds and maintenance specialist Gary Vinson toiled ceaselessly in advance of the storm and, as we go to print, are finally nearing completion of storm-related clean-up and repair tasks. Bonnie Zeller and Prudence Romano gave support to Linda Heffner, who faced many challenges including insuring our office tasks were completed without reliance on the internet. Without the assistance of all, the managerial tasks faced by Cindy Bear would have been fraught with peril! Throughout Pine Island, neighbor helped neighbor and devised solutions to cope with the difficulties at hand. Surely the Calusa who lived at Pineland did the same, some 1700 years ago.